In other words, strategery plus! That will presumably be provided by Rice and her partners at RiceHadleyGates, which has offices in Silicon Valley and Washington, D.C., in an undisclosed financial arrangement with Khosla. RiceHadleyGates also includes former National Security Adviser Stephen Hadley, former Secretary of Defense Robert Gates and former State Department official Anja Manuel. In an interview yesterday, Manuel said that the goal was to help in areas that VCs might not be as familiar with, from Internet freedom laws in India to the challenges of moving into emerging markets. It’s certainly a high-profile move, although Khosla has done this before, signing former British Prime Minister Tony Blair on as a strategic adviser in 2010. In addition, Andreessen Horowitz brought in former Treasury Secretary Larry Summers, as well as former D.C. Mayor Adrian Fenty, to lend its portfolio companies additional expertise. Rice’s firm certainly has a lot of that, especially related to thorny international issues. 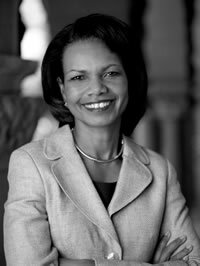 Rice, who was once the provost at Stanford University, was also the National Security Adviser in the administration of former President George W. Bush, before moving to the State Department.